Product #20478 | SKU 1SKB-R906U20 | 0.0 (no ratings yet) Thanks for your rating! The SKB R906U20 6U Roto Shock Rack features a 50.8 cm deep rack frame installed in a roto moulded tough shell with an integrally moulded valance that eliminates the metal valance on the outside of the case, coupled with a rubber gasket on both the front and rear doors for water resistant protection. The integrated moulded valance, ergonomic handles, and recessed, heavy-duty twist latches allow these cases to meet most ATA and military specifications. 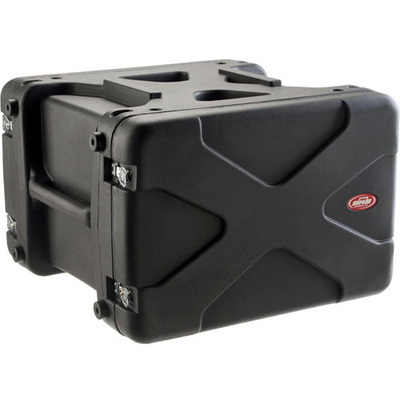 This SKB-R906U20 Roto Shock Rack case has the Roto X pattern and is stackable within the series.